Traffic is an inevitable problem for metro cities around the globe. Intelligent traffic management system helps to improve the traffic flow by detecting congestions or incidents and suggesting appropriate actions on traffic routing. A new and dynamic internet-based decision-making tool for traffic management system was proposed and implemented in authors' previous works. The tool needs weather, road, and vehicle-related integrated information from different data repositories. Several online web portals host real-time weather data streams. However, road and vehicle information are missing in those portals. In addition, their coverage is limited to city-level congregate information but precise road segment-based information is necessary for real-time TMS decision. Internet of things (IoT)-based online sensors can be a solution for this circumstance. 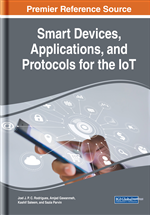 As a consequence, in this chapter, an IoT-based framework is proposed and implemented with several remote mobile agents. Agents are securely interconnected to the cloud, and able to collect and exchange data through wireless communication. An internet based real time bi-directional traffic management support system was proposed and implemented in Rahman and Akhter (2015,2016), Nawrin et al. (2017) and Akhter et al. (2016) with the integration of different modules including traffic monitoring, road weight updating, forecasting, congestion management, and optimum route planning decision. The decision making of that system requires different environmental attributes including rainfall, temperature, wind, and humidity, and other road and vehicle-related decision attributes- peak hour, speed, road status, road accident status to calculate the road weights in real time and thus able to recognize current/future traffic operation(s) and traffic flow conditions. Therefore, the system can precisely administrate, monitor and control moving vehicles. The values of the environmental attributes are intelligently crawled by search engine, with meta-data indexing (title, description, keyword etc. ), directly from the multiple data feeds (like website, RSS feeds, web service etc.). However, their coverage is limited to the city level. In addition, location/area based congregate information at an instant is necessary for accurate TMS decision-making system. In addition, there is no availability of real-time road and vehicle-related information. Embedded devices/sensors are required to collect information from the mobile vehicles. Moreover, devices need to communicate among themselves and transfer the acquired information to the TMS system. Subsequently, TMS decision-making system will make routing related decision from those data. Internet of Things (IoT) is a network, where remote agents are interconnected and able to communicate with each other (sensor enable communication), can be a solution for this circumstance. IoT in traffic system needs to collect and integrate real-time traffic information, process and analysis them automatically, and makes the system more self-reliable and intelligent. The aim of this chapter is to present a secure IoT-based framework for real-time traffic related information acquisition with monitoring architecture, and to implement it with several remote agents utilizing wireless communication (GSM/GPRS/Bluetooth). Each agent is an embedded device with integrated sensors (including DHT11, Raindrops Sensor Module), Arduino microcontroller and GSM/GPRS/GPS Bluetooth enable modules. There are many models for IoT-based TMS. The solutions are varying in respect to their applied technologies. As an example, Radio Frequency Identification (RFID) based IoT, which is suited best for smaller spaces, where the infrastructure is already in place to use it. RFID requires specialized scanners to read data, and specific receivers to transmit data. The proposed agents are securely interconnected with an authenticated cloud server (AWS) using GSM/GPRS based HTTP protocol, and able to collect or exchange encrypted TMS data among themselves through GSM/GPRS/Bluetooth wireless communication. Agents can collect specific data with a degree of autonomy and interact with the cloud server (without human intervention). In addition, the agents have fault tolerance systems as they are capable to communicate (sending or receiving data) with the cloud server even the failure of GSM signal. They do this by connecting another nearby agent or authenticated mobile phone (GSM enable and has signal) using Bluetooth communication channel and request him (agent/phone) to communicate with the cloud server. In addition, AES 128 CBC encryption and/or decryption algorithms are used to secure the data transmission.